A coming together of everything that’s good for you! 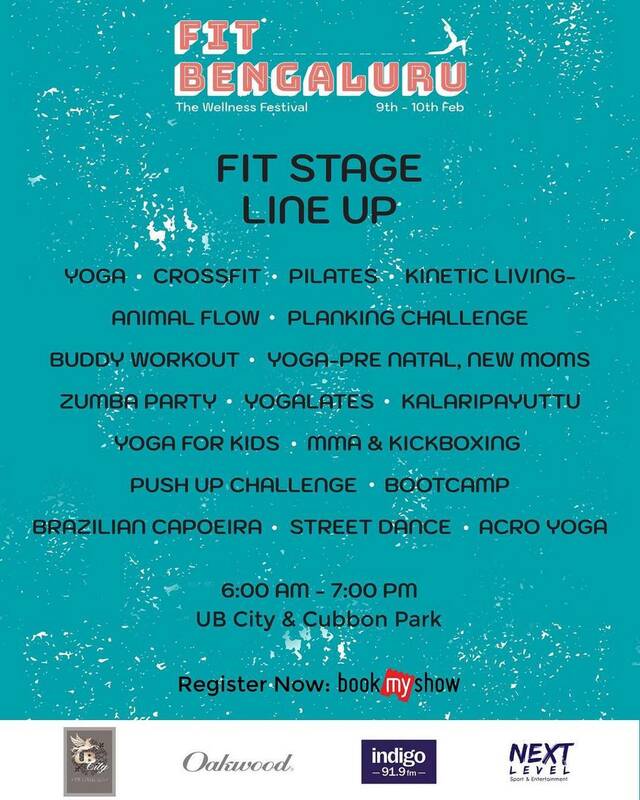 Bangalore will see a first of its kind wellness festival on the 9th & 10th of February 2019 at UB City and Cubbon Park. Dedicated stages will host workouts and talks by leading trainers and experts in the country. Accompanying this will be a Fit Bengaluru 5k Run, aqua activities at Oakwood, a fit food market and an eco – market. All this and some more at this 48 hour uplifting experience for your body, mind and soul! - Swetha is involved with Fit Bengaluru in more ways than one! Apart from being a consultant and sounding board for festival, she will also be conducting a buddy workout session at 10 am on Saturday, the 9th of February. Swetha has been a personal trainer for over a decade with close to 10 certifications from the UK and the US. She is also one of the 5 Nike certified instructors in the country. Come prepared to take your endorphin levels through the roof with her session at the Fit Bengaluru 2019! - The man behind India's biggest Movement Fitness Facility, Chaos Faktory - Delson Joy D'souza! Make sure you catch his Parkour & Calisthenics session at UB City @ 7:00am on Sunday, 10th of February. - A new age fitness fusion of YOGA and PILATES designed by Kushi Rai - "YOGALATES" is one of its kind in Bangalore , which aims to harness the physical and mental benefits of both practices. 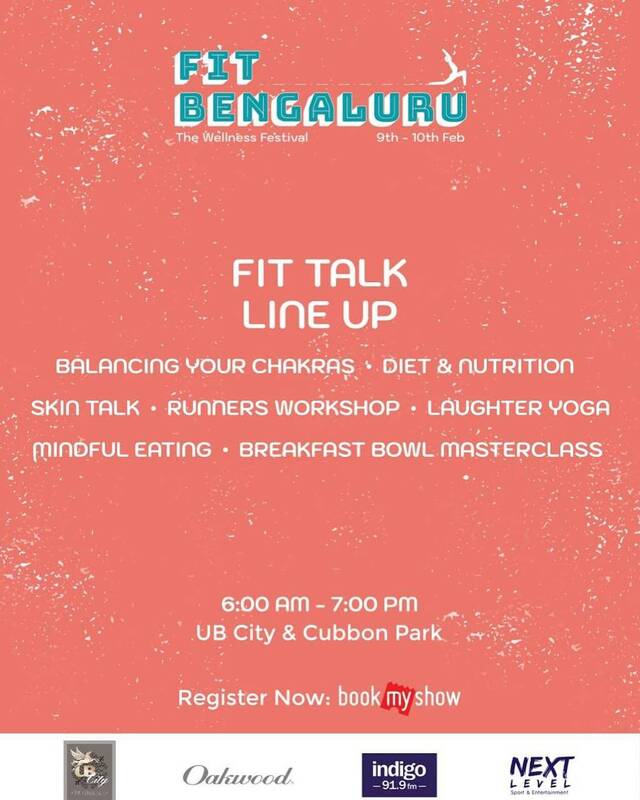 Be a part of this unique session at Fit Bengaluru at UB City on 10th of February @ 3:30 PM. - You want to be NinjaFit? Devrath Vijay will be conducting a movement session where you will experience the fluidity of Animal Flow®️ and build functional strength, the Ninja way! Devrath is a well-known name in the Indian fitness industry, popular for his movement skills and his ability to mentor and inspire trainers all over the country. Workout with @ninjadev at Fit Bengaluru on Sunday, the 10th of Feb at 10 am at UB City. - Kalaripayuttu, an ancient martial art form is believed to be the forerunner of many Asian martial traditions. Sreerag from the Attakalari centre for movement arts will be conducting the workshop. Sreerag is trained from the Hindustan Kalari Sangam in Puthiyara, Calicut and comes from the lineage of Kalaripayattumasters such as Guru Veera-sree Sami gurukkal. He has been practicing Kalaripayattu since 7 years of age. 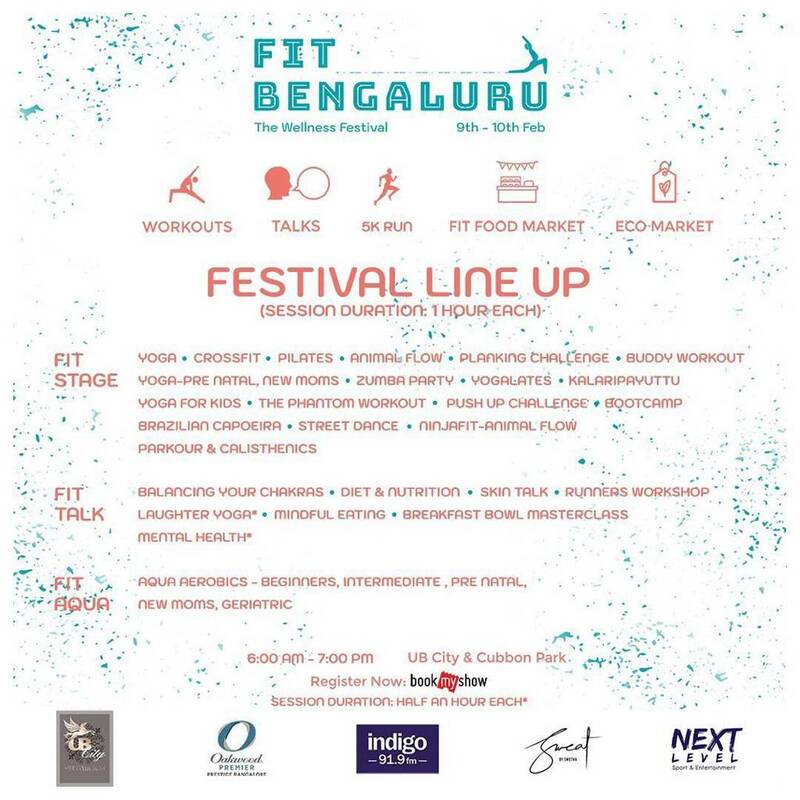 Make sure you catch Sreerag and team from Attakalari at the Fit Bengaluru on the 9th of February at 11 am. - Harihara will be bringing his Crossfit session to Fit Bengaluru.Hari is probably one of the most certified trainers in the country with over 18 years experience, L2 certification in Crossfit and L1 in Gymnastics. Workout with him at the Fit Stage at UB City at 9 am on Saturday, 9th of February. The latest events in malls - product promotions, celebrity visits, product launches, events for kids, band performances, DJ Nights, Festival Celebrations, Social Causes and more.